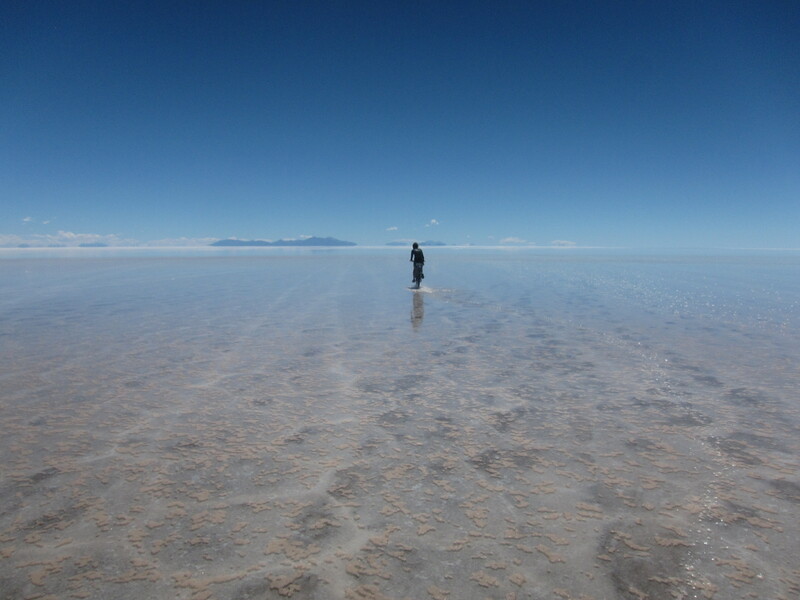 Bolivia- what can be said about this country? In a few generalizations; it’s poor, mountainous, and landlocked. Our southwestern route was only a small portion. 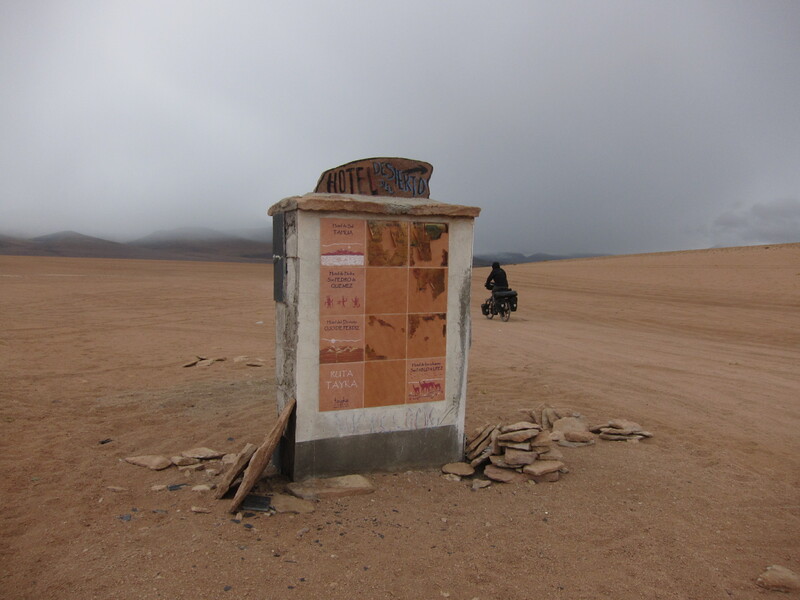 We did not see the north to south eastern part of Bolivia’s Amazona. We even did not go to Potosi or Santa Cruz. 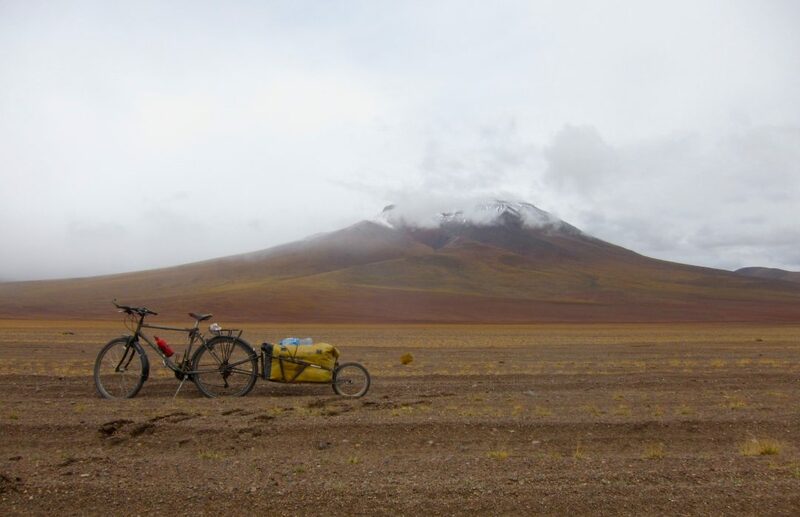 We cycled from the lake Titicaca through the chilly Altiplano lands where substance farmers work, and later, an intimate time in the most isolated zones of Bolivia’s desert. 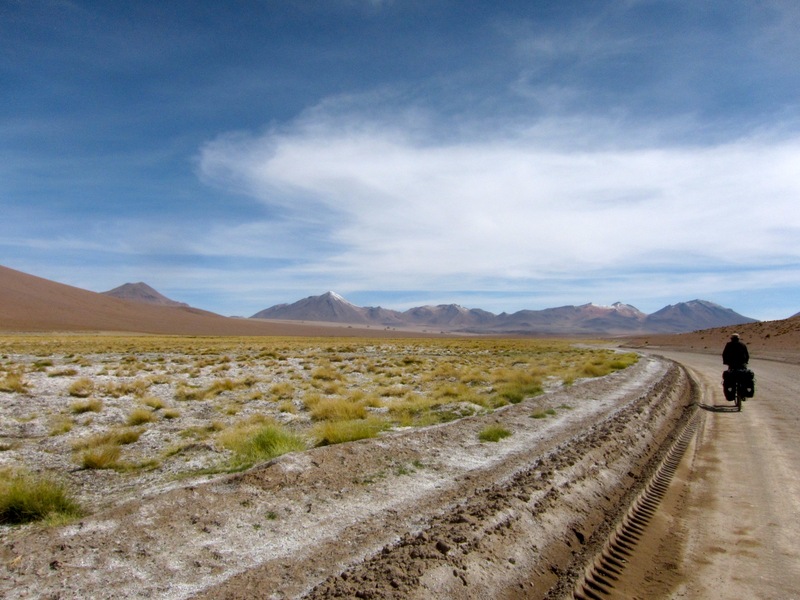 For me, it was difficult to like Bolivia at first. The people were not socially open. Resources like food, water, and services, were severely limited. The road infrastructure was our worst nightmares true. 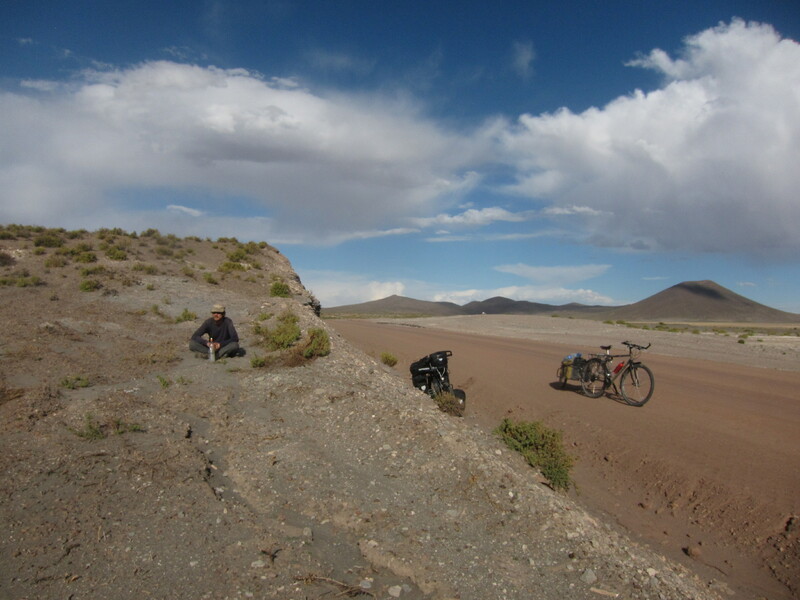 The leg of our south west Bolivian tour was one of our toughest cycling experiences. 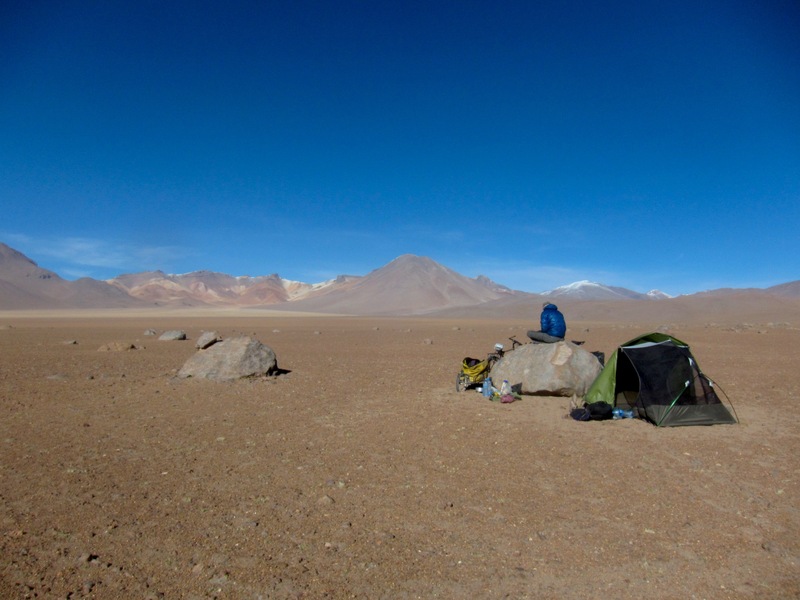 Ten days in a inhospitable high elevation desert. No paved roads and no signs. In fact most of the time there was no road, but only tracks left by the old Lexus SUV models hauling camera-armed tourist through the desert. They were our assurance that we would not be long without aid if we needed it out there. 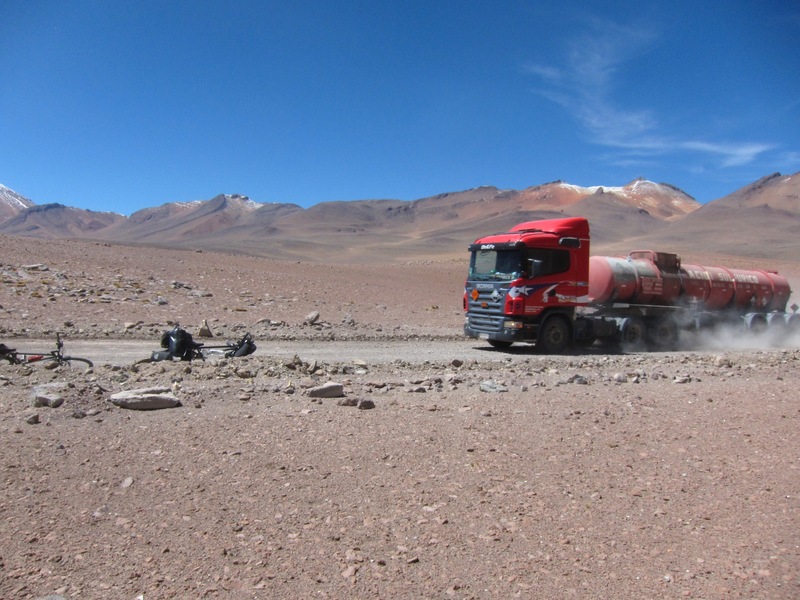 Even so, we had to be prepared for two weeks on the isolated route. We stocked up on two weeks of food and water purifying tablets. 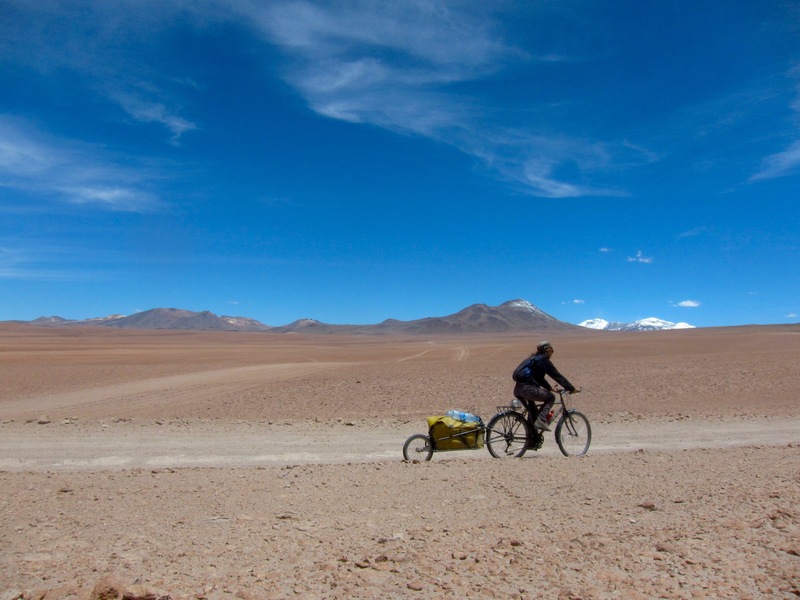 Cycling the southwest part of Bolivia was one of the most extraordinary moments in this tour. Perhaps in all my 26 years the voyage was something so spectacular and so intense. 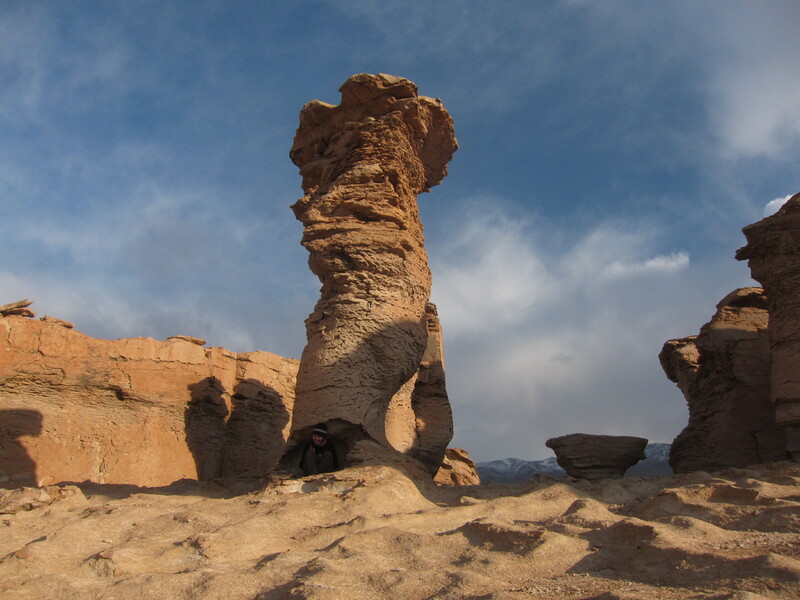 The blue sky span over the expanse of raw nature of red mineral, prominent volcanoes dusted with snow, juxtaposed with dreams of Dalí’; wind cut stone formations on a interminable stretch of sand. Touring the lonely lakes and lagoons; Hedionda, Verde, Colorado, and Chalviri, were mystical and breathtaking. There were color lakes of ice green, coral red, and blue as the sky above. 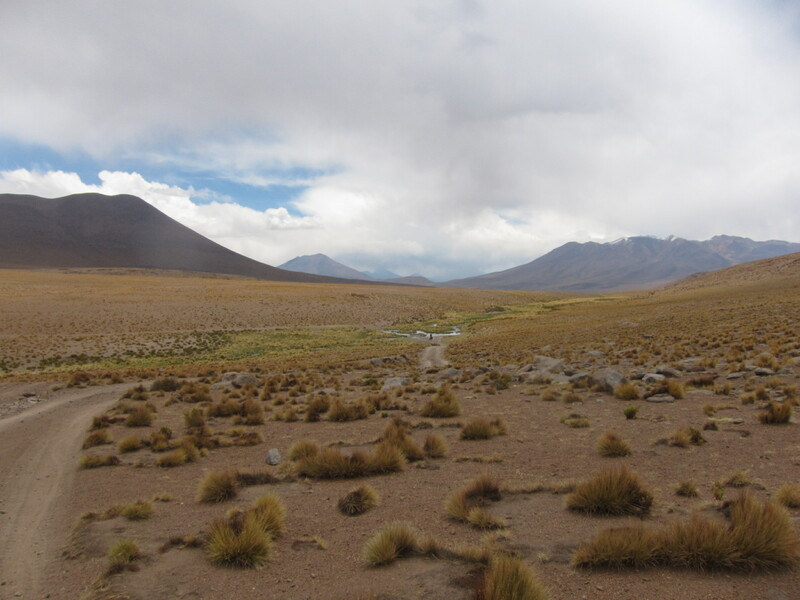 And wildlife, open and free offered a daily spectacle of the vicunas, flamingos, and I may have seen a Altiplano cat! In Oruru we rested in a hotel. 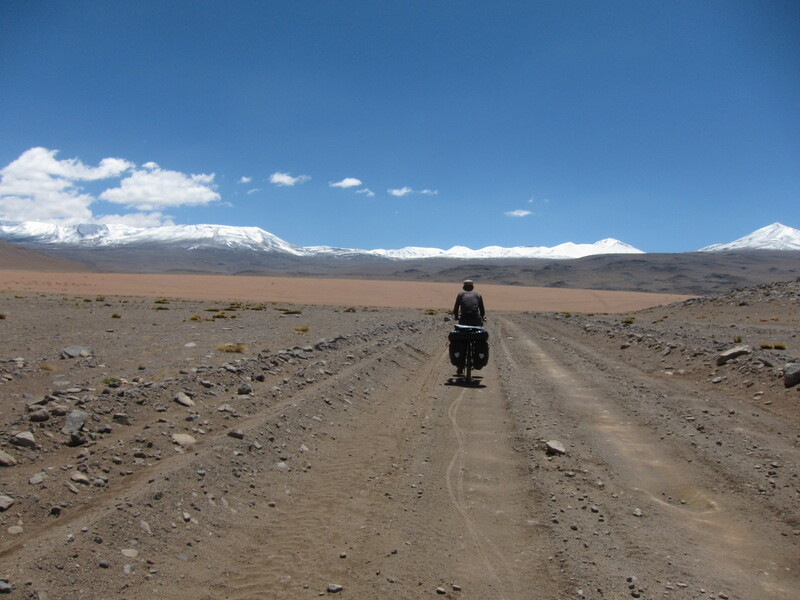 After Oruru, there was 150 kilometers left of paved road in Bolivia, until the ride on the unpaved road. 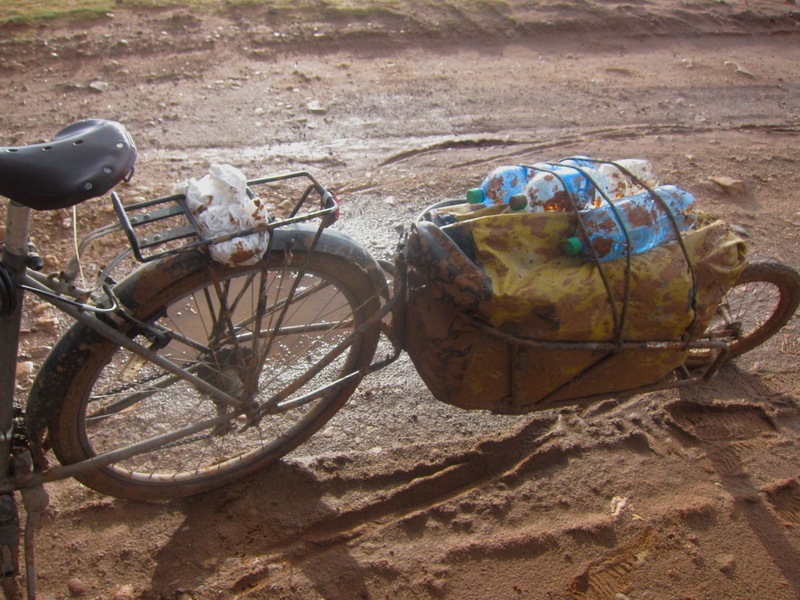 The combination of seasons; rain and road construction left us to hours of bike pushing in ankle deep mud. Our daily distance dropped from 90 kilometers a day, to an exhausting 30. Storms sometimes cut the day short, and roaring thunder was frighteningly dangerous as we were in the open and very high in the mountains. We did the second counting test to estimate what was the closest lightening strike, and one was 300 meters close to our tent. 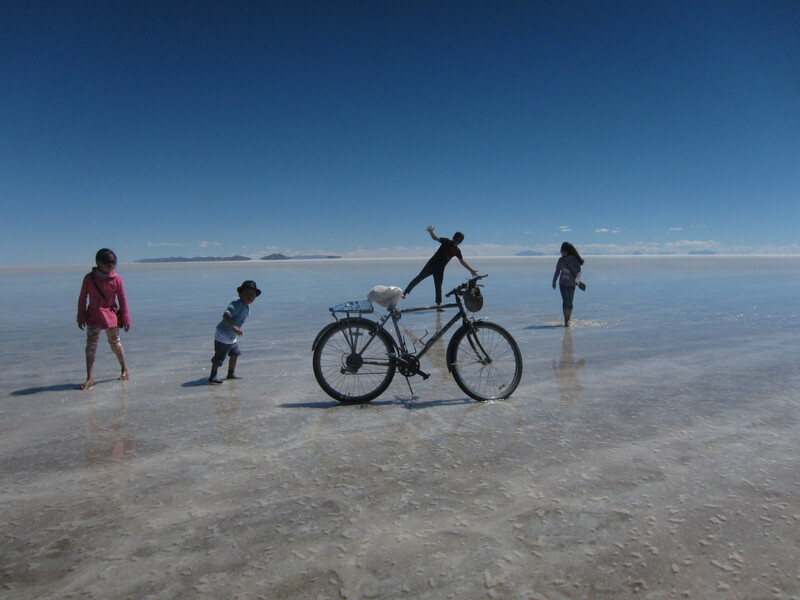 The town booming with tour operations, Uyuni, was out last stop of moderate civilization. We arrived as the town was preparing to host the Dakar races. In days the town blew up as if it were the Olympics. 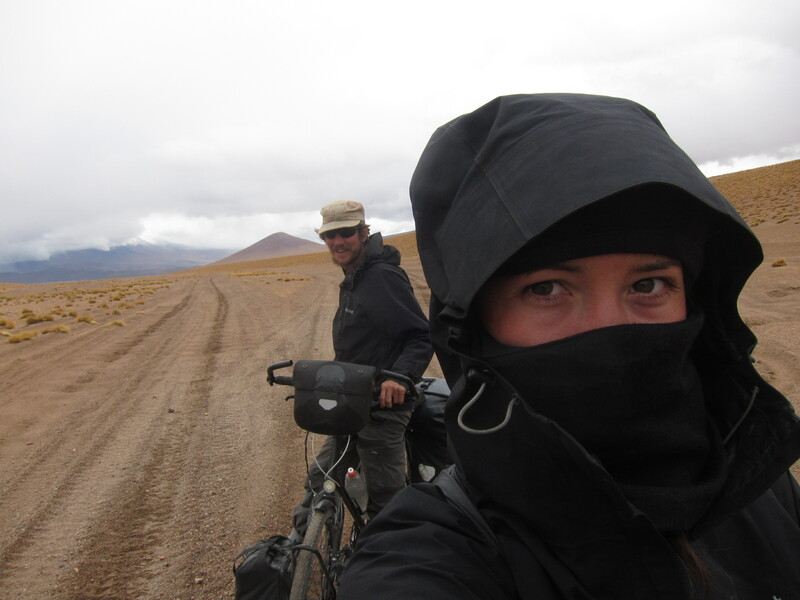 20 kilometers before Uyuni, Paul and I arrived to the worlds largest wonder, the Salar de Uyuni. 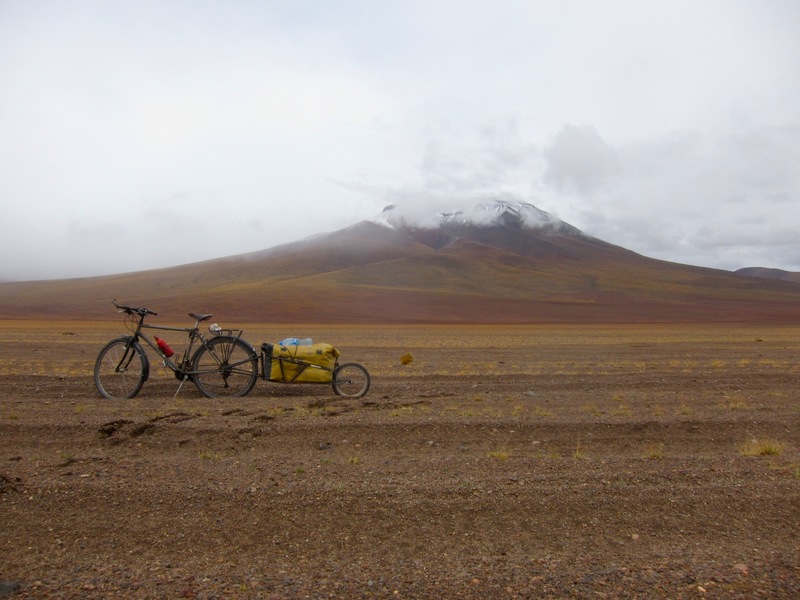 Although the day was cold and overcast, and with out bikes loaded, it was not tempting to cycle on the Salar. 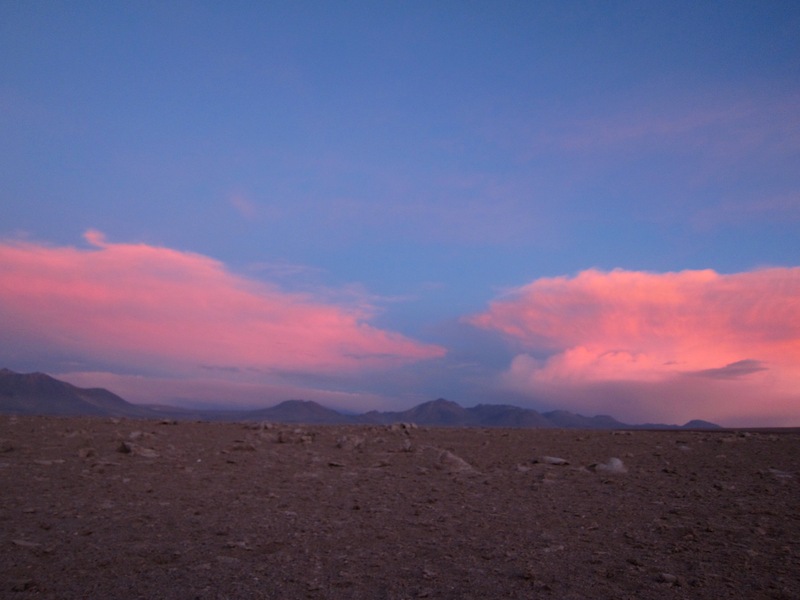 The following day the sun was out, and I felt that the day before did not do justice for the Salar experience. 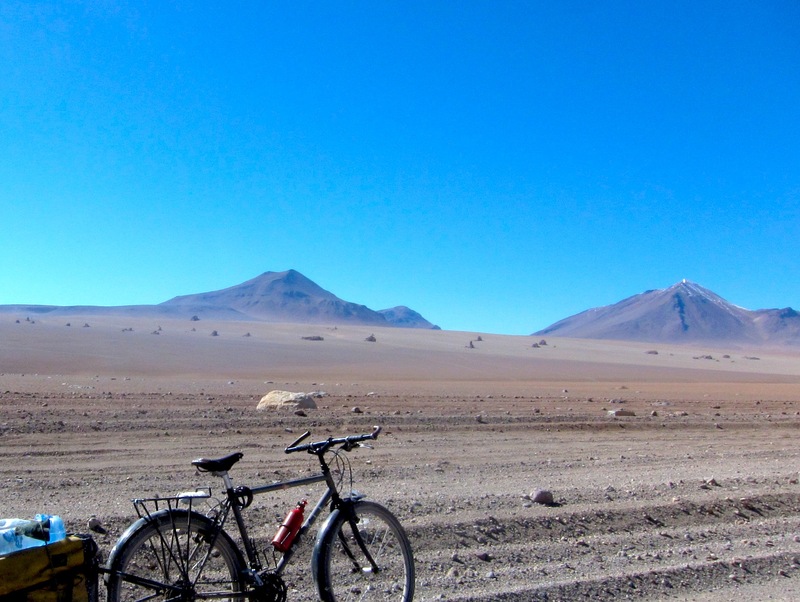 So I cycled from the city without the gear, and cycled to and from the famous Isla Incahuasi. The first day at the Salar it was overcast. From the salt share, we watched the cars drive into the enormous puddle. Paul and I were tempted to cycle, but we were dubious about the gear falling into the salt water. 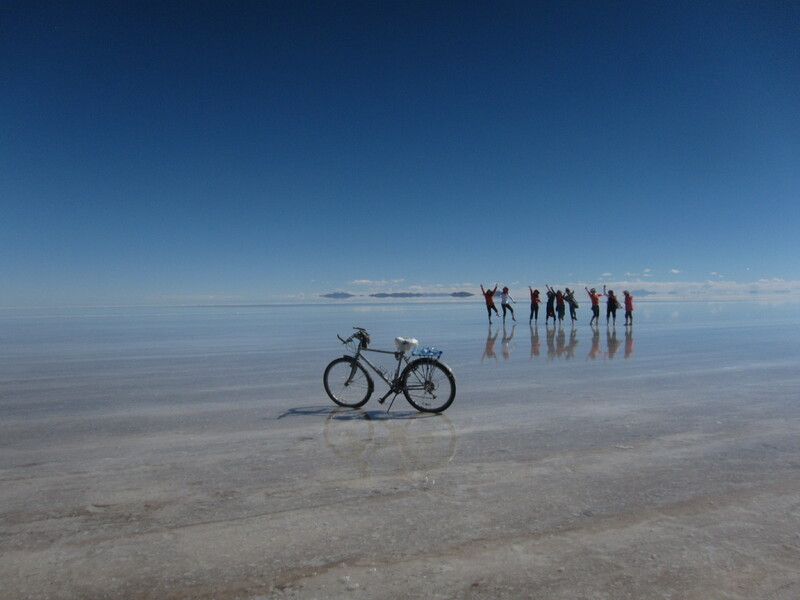 The following day, I cycled into the Salar, and to the center of the Uyuni salt flat at the island named Incahuasi. Many flags stand here showing the worldwide attendance to the Uyuni salt flats. I could cycle the harden floor of the salt, in 20 centimeters of water flat until I reached the “island” i reached top speed heading into the illusory blue with no horizon. It was my most surreal moment experiences. Water warm by the sun and salty earth splashed my legs and wiped in the fenders of the bike. In all the directions, it was like looking into infinite space. I asked people is they wanted to take photos with my bike for the optical illusion of standing on the bike. A group of Korean ladies pose for my camera. 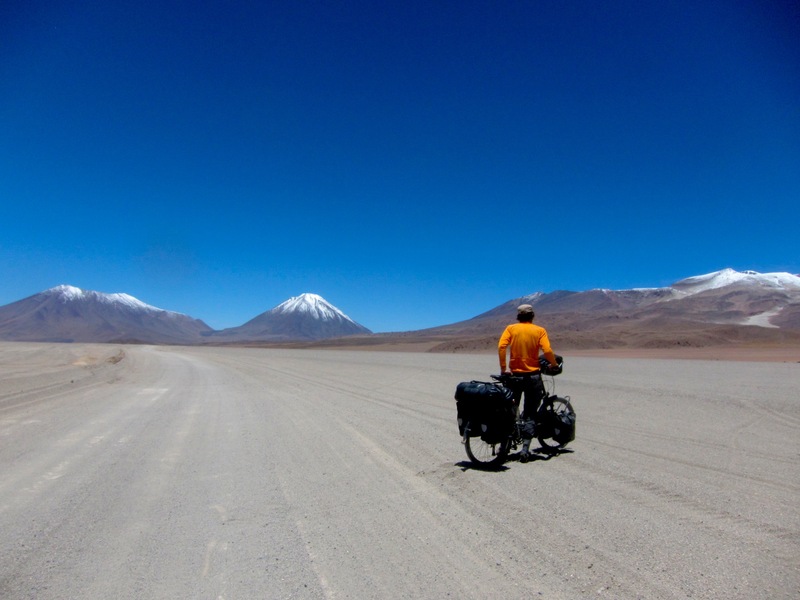 After Uyuni began the much anticipated journey that most of us crazy cyclist touring the Americas do; the road though southwest Bolivia. 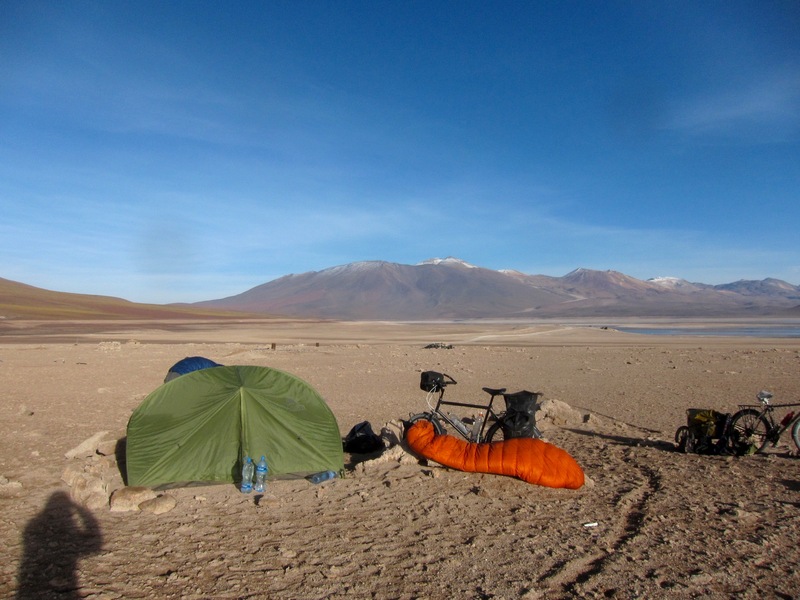 It is the challenge of 10 days cycling roads said to be in the worst conditions of the world. Either sand, gravel, large rocks or washboard, and usually a mix of all. 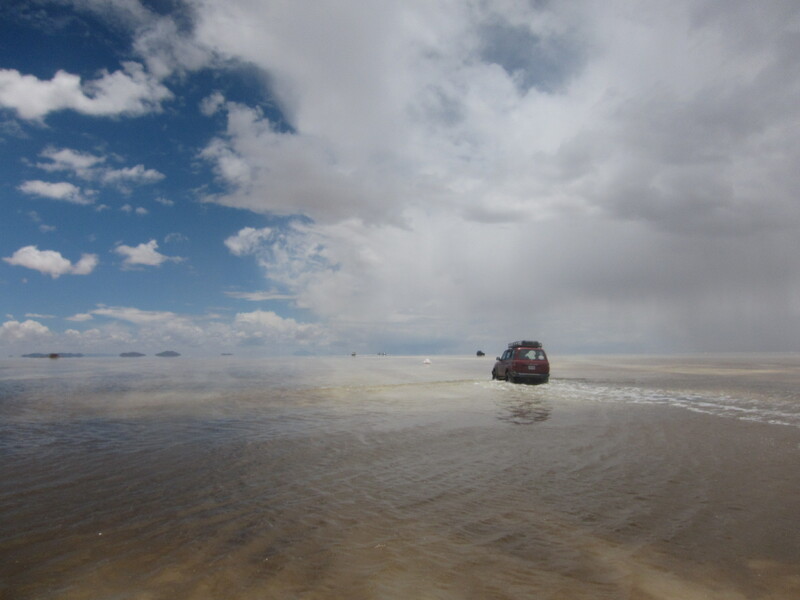 After what we went through in the north to Uyuni, it was nearly convincing that this was going to be hell. 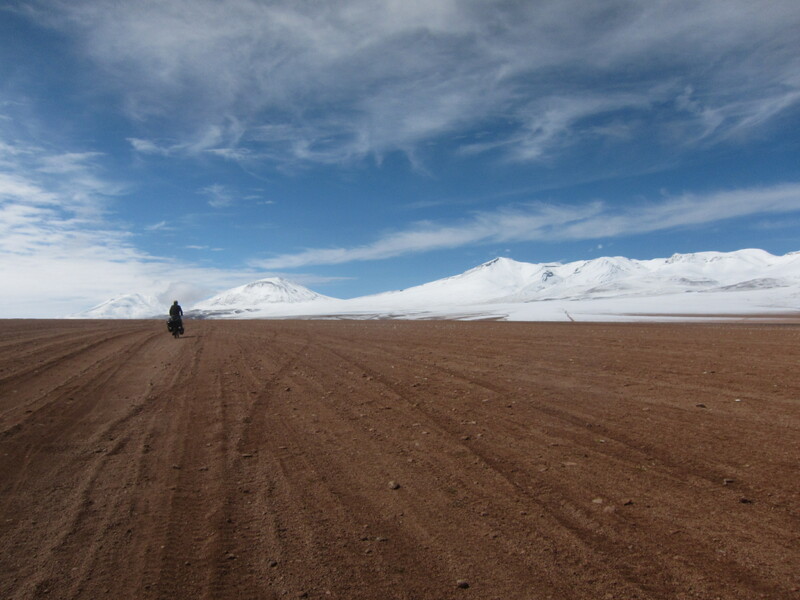 Actually, the conditions were better than what we saw between Oruro and Uyuni. We did not have rain storms that turned the road to mudpools. But we did experience powerful winds that nearly broke the tent and blew us off the road. The day, we had to stay covered from the suns powerful rays. 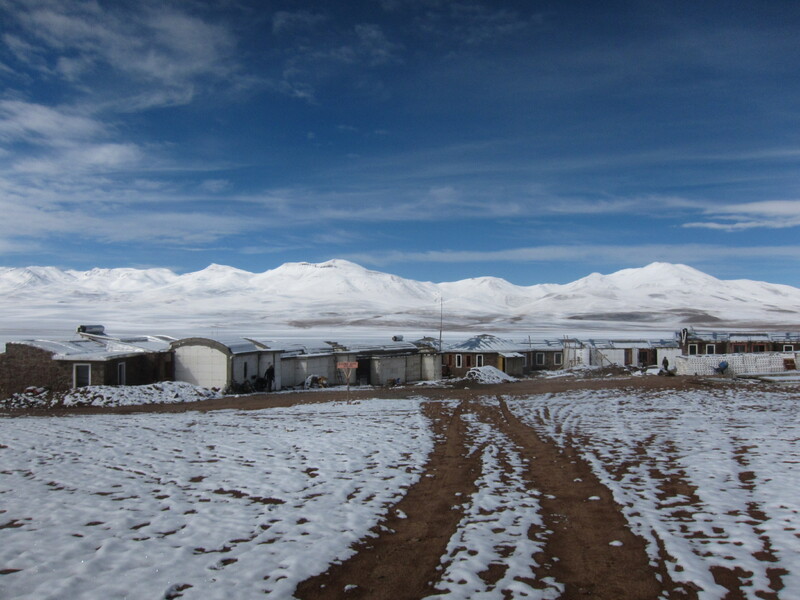 In the nights we had to layer with all our clothes- the temperatures dropped sometimes below -5 C and lower with the wind chill factor. We didn’t run out of food before San Pedro, although the restriction of small snacks replacing a normal lunch, was not enough for us to reach optimal calories. Peddling and pushing for 9 hours in these conditions taxes are body to the maximum. You can assume there were many episodes arguments, psychological and physical breakdowns more intense than an MTV reality program. This was as real as it could get. And through all the tears and exhaustion, it was all totally worth it. Here is a 10 day count of our wild journey. 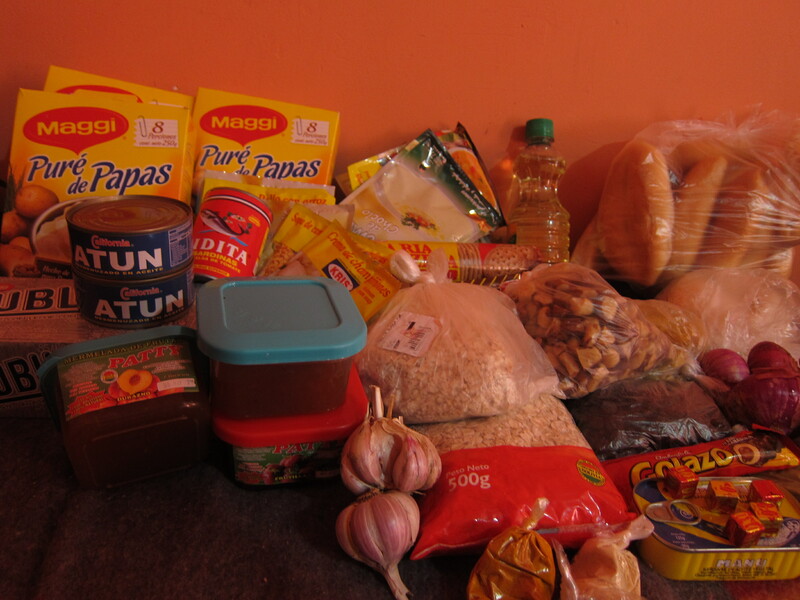 We stocked up on food in Uyuni. It was not enough. We bought more food a couple days later. 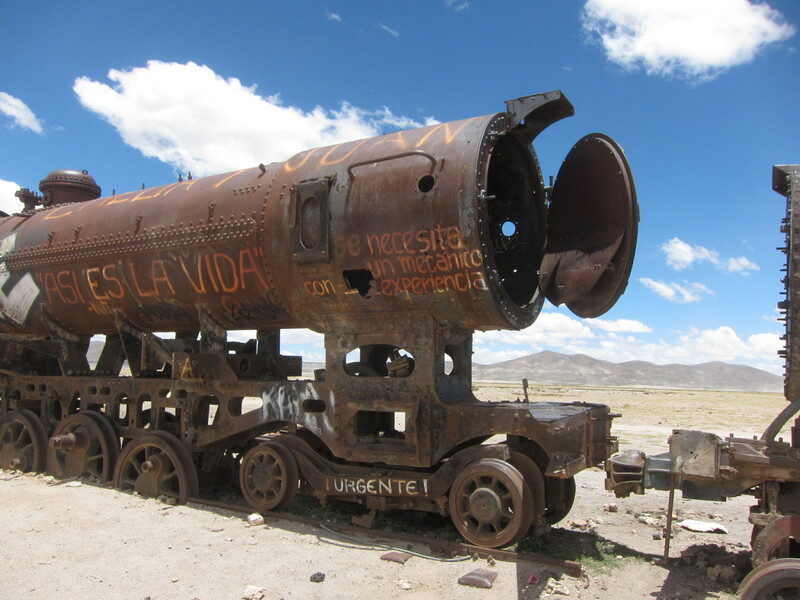 There is an old train station just outside of Uyuni filled with old steam engine trains. At the end of the day, we arrived to Ramaditas for water. Paul turned the knob, but no water flowed. 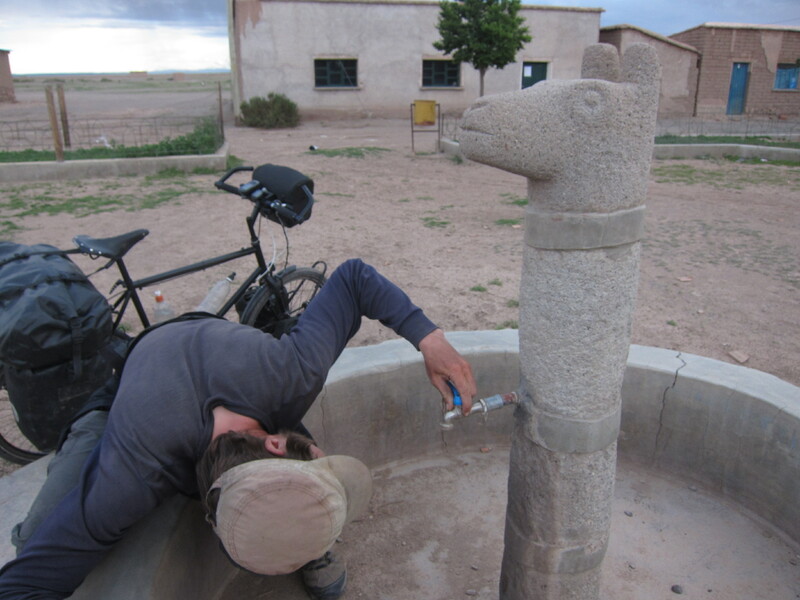 We asked around and found another tap that gave water. A couple of guys (perhaps Chilean?) stopped to give me a bottle of water. 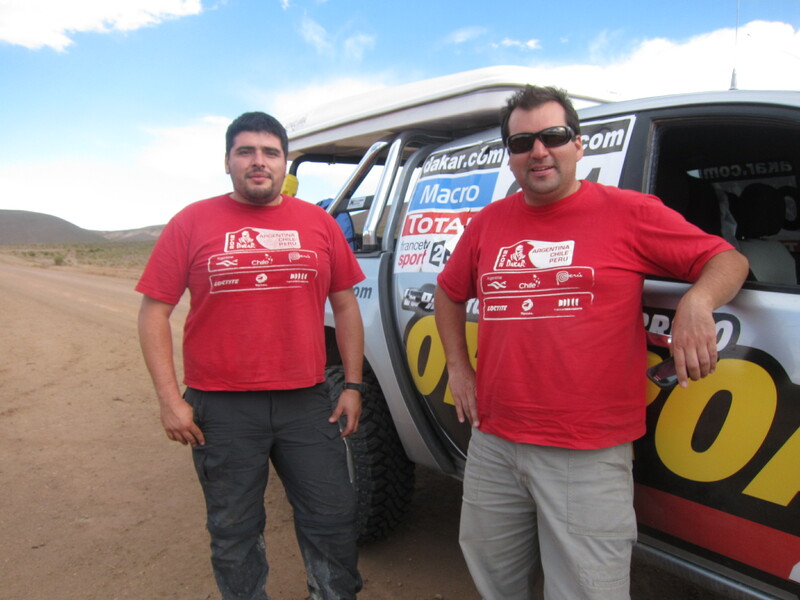 They were part of the Dakar organization and they had so many questions about how could we stand being out in these conditions. A pause for a cookie break. 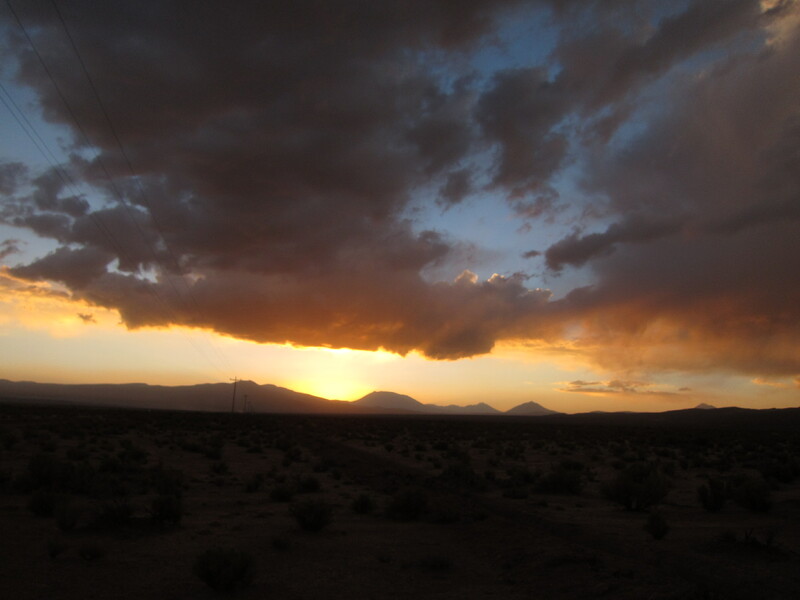 The rewards of cycling in the Bolivian deserts are incredible sunsets. 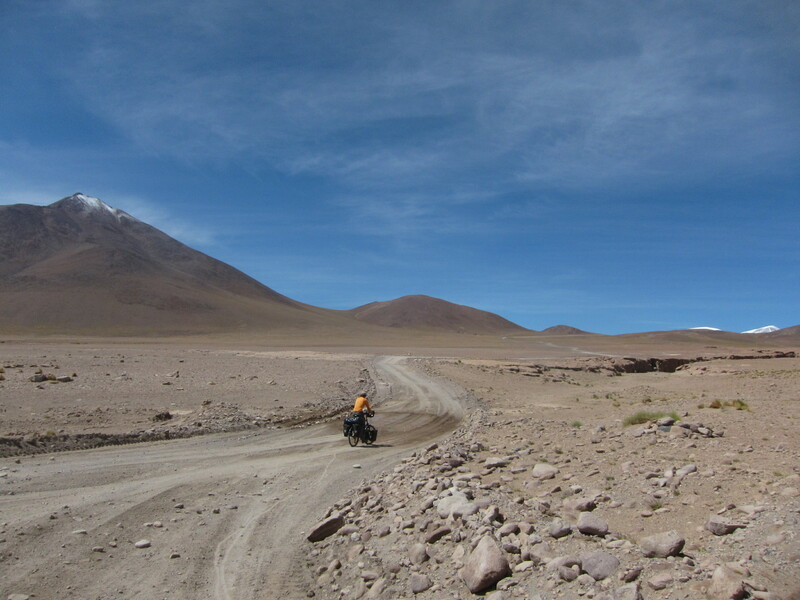 The road took us to the Valle de Rocas. It’s Amazing to see what the wind and erosion can do to the different stones. 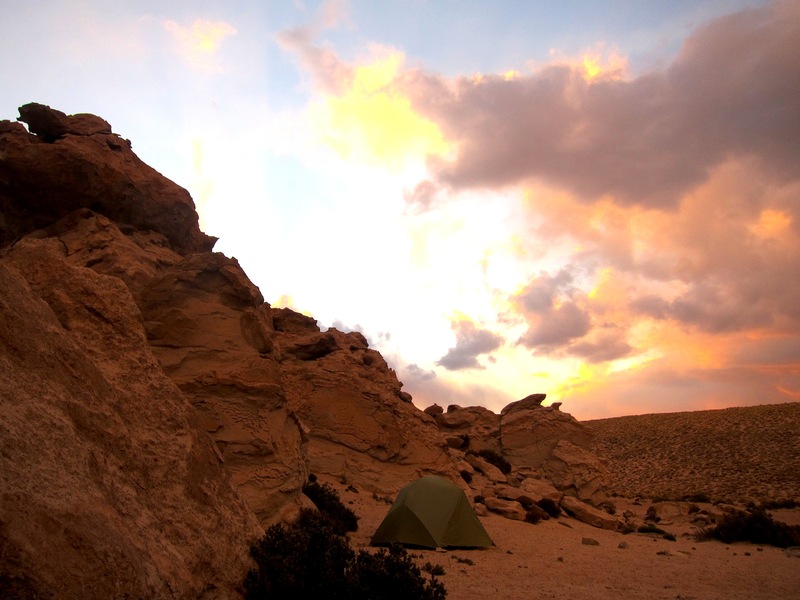 At the end of our day, we found a secret gem of a camp spot. There was a wall of eroded rock walls, and behind this wall were a few of these towers (formed by wind erosion) It seemed it could be a place where tourist visit, but it was off the old road and the SUV’s took the new road behind the hill. This left us privacy and a place of natural wonder to enjoy for ourselves! Our home for the night. One of our favorite camping spots. 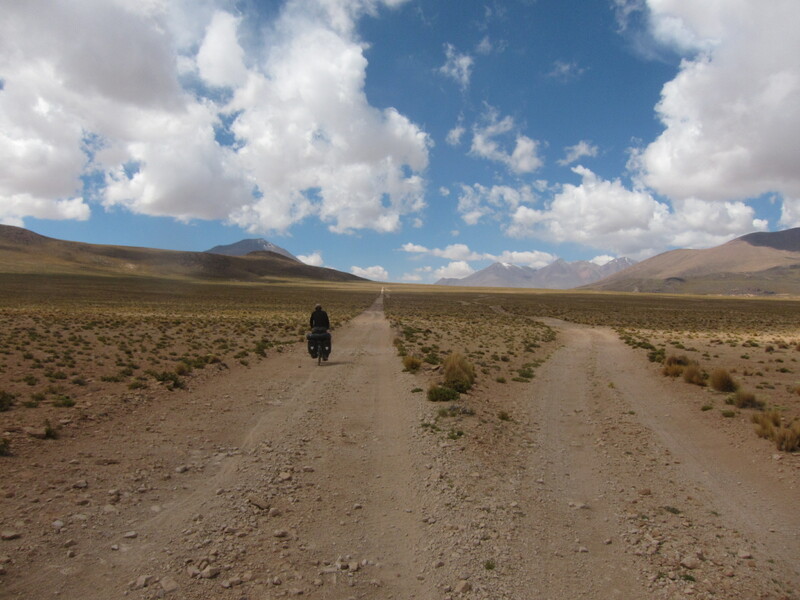 For much of the SW Bolivia route, there were NO ROADS. Only tracks left from the SUV’s were evidence of where to go. 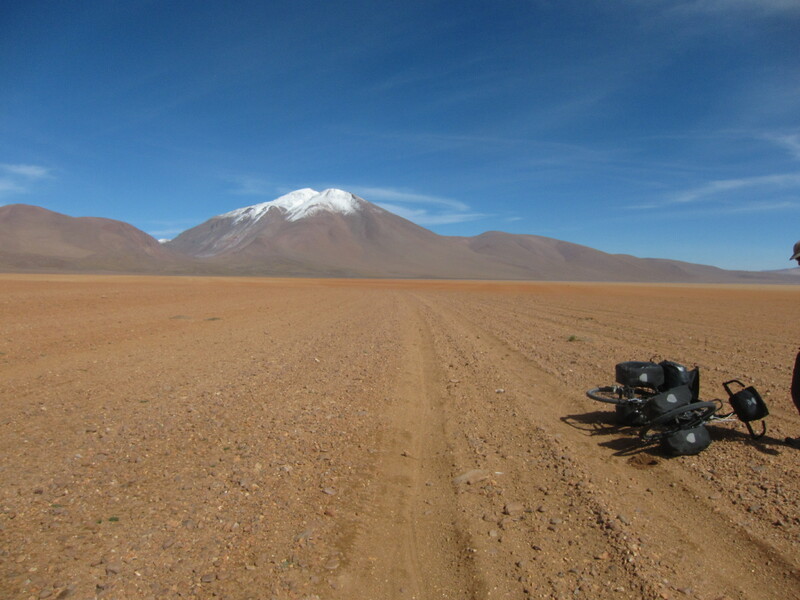 We had Paul’s handy GPS to navigate our way and a PDF on cycling SW Bolivia. The road took us over gorgeous valleys. So many nights of camping in the cold, but we luckily found a couple refuge hotels that allowed us to camp in an empty room (under construction), for free. This was before the Laguna Hedionda. Laguna Hedionda, a beautiful, but smelly lake. The smell of sulfur is strong, that’s why it’s nickname is the “Stinking Lake”. There are many species of flamingos that migrate here. The next morning, flamingos were out on Hedionda for breakfast. Just one track, of many, in this desert. Almost at 4,500 meters, I put my balaclava on (Thanks Will Adams!). It was extremely cold! The last hours of the day we pushed, literally the bikes, through the sand, which seemed endless pursuit. 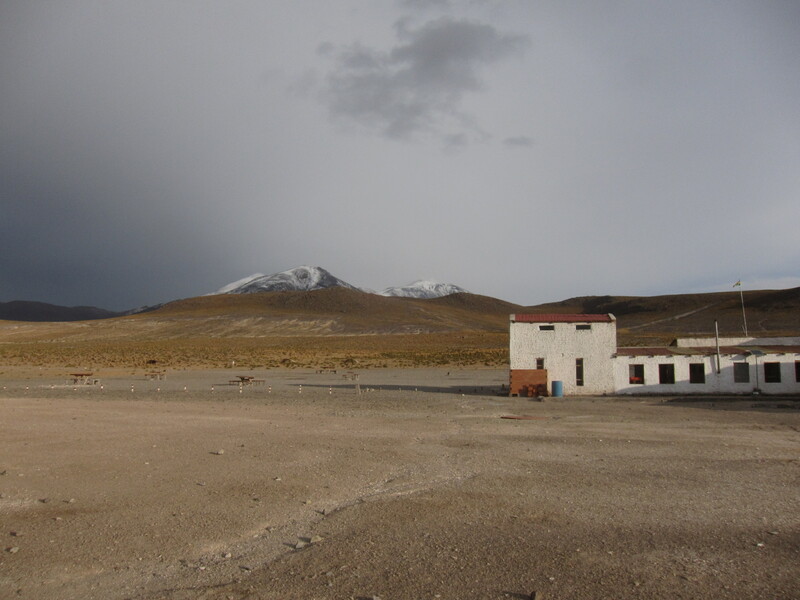 Yet, we finally arrived to the junction, where an option to go to the Hotel de Desierto for an extra 2 kilometers. We did just that. One of the hotel guys found us a total hot mess, we could barely talk. He offered us a room (again, under construction) for camping. The next morning, the guys at the hostel invited us to have breakfast. A huge thanks to them, for a proper meal, shelter from the wind and a bathroom to use! They run a very comfortable hostel out in the amazing desert. Graciad Hotel del Desierto! The next morning, we awoke to snow covered desert. They folks there said it was rare that snow falls, and especially this time of year. It was a magical morning to see a rare phenomenon. But the snow covered ground didn’t last. It melted quickly, right up to the foothills of the surrounding mountains. The road conditions were better today, it wasn’t long before we reached to today’s destination; Arbol de Peidra. Plenty of gringo-filled SUV’s were there. Paul and I retreated to find a private place to camp. If you are wondering why we seem anti-social.. just imagine being asked for the 13th time in an hour “Did you ride you bikes to here? From..?” Yes folks, we did, or do you think we just brought the bikes just to take the photo with? 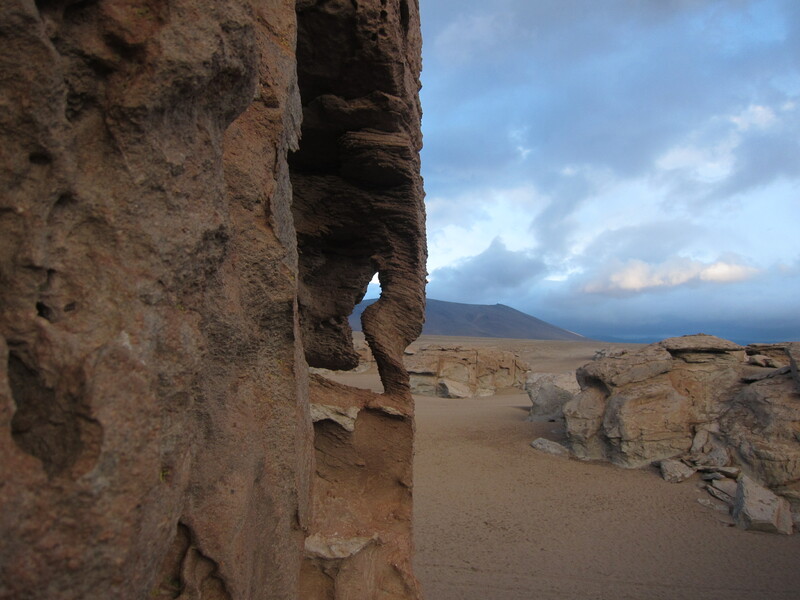 Around here there were some amazing rock formations, like this spiral forming a window. Woke up to a blue sky morning. 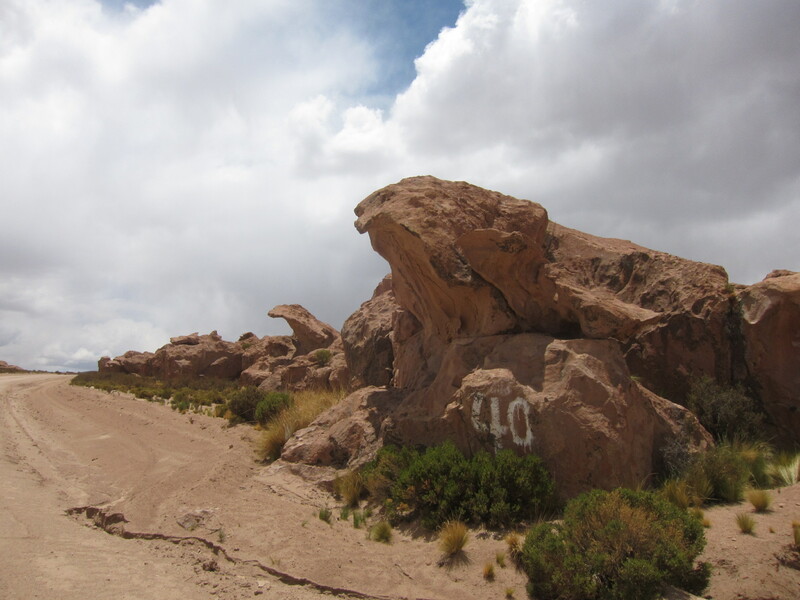 The SUV’s had already arrived and photos of the Arbol de Piedra were being snapped. 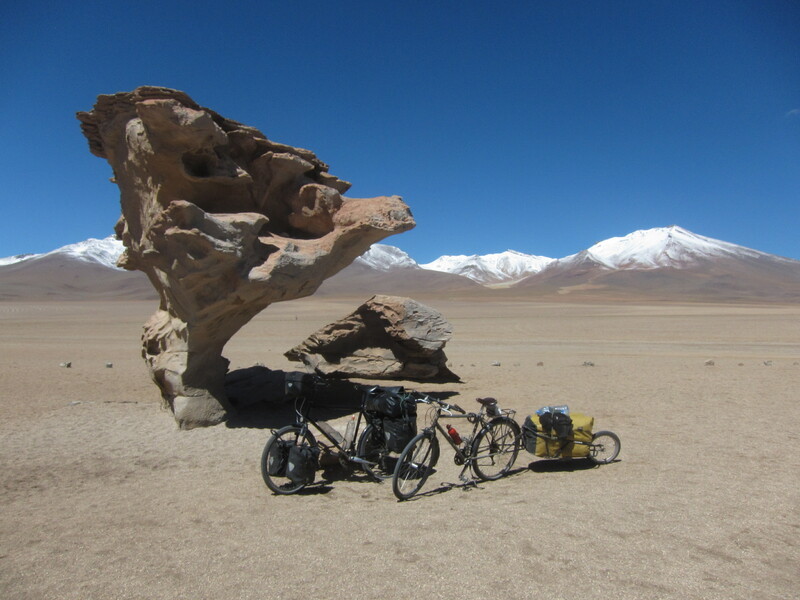 We got our photo’s with the iconic rock, the Arbol de Piedra, then off we were for another day of cycling. A good road, for most of the day. A good road makes the day go faster. We arrived to the national park. 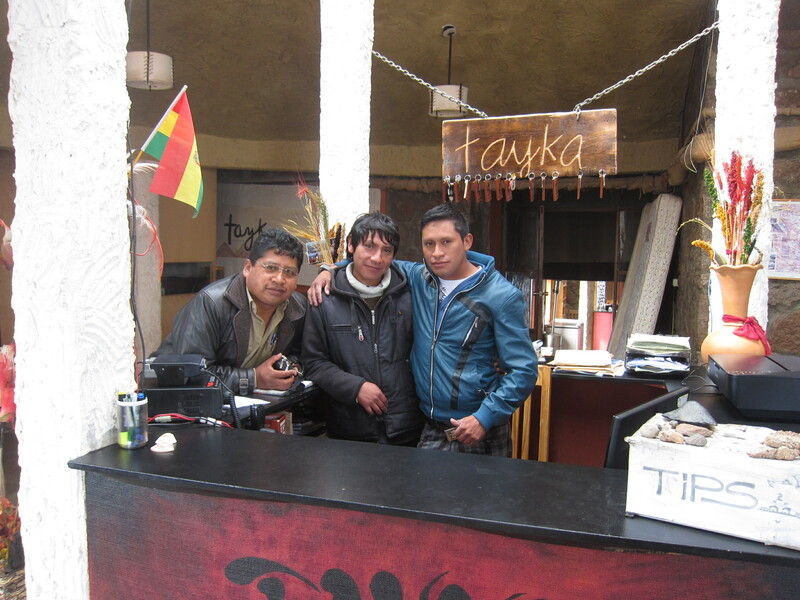 We paid a 150 Bolivianos fee for the 4 days, but at the exit they didn’t care how many days extra it took. At the park entry there lies the Laguna Colorada. It’s a pink-colored lake! We couldn’t get too close because of the murk surrounding. but from afar we could see some formations of _ around the lake and many flamingos.Past the lake a road came to a junction where we could go to a town _ for rest. For the third time, we got invited to sleep in a room of a hotel under construction. The next morning, we took a long and rough way to the road. Whew! Finally… After 5 kilometers that took us a long hour and 30, we reached the road that would take us to our highest climb of this Bolivian tour. It was also the day I reached the highest elevation by cycling. Here we were still climbing up, but we made it to about 4,920 meters in elevation! Another rest brake for crackers and jam. We did not consume the necessary amount of calories equal to what our bodies were burning. 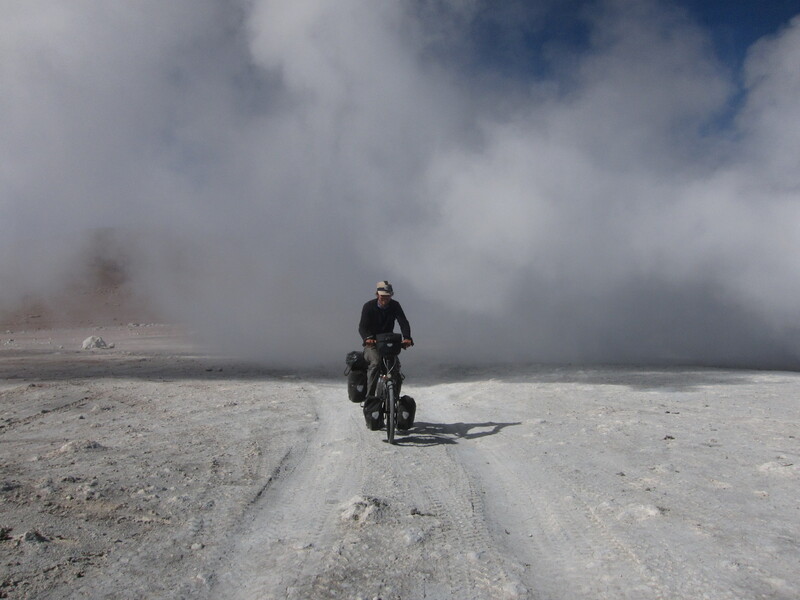 Here we reached the Sol de Mañana, a active geyser zone. In the photo was our home for the night. Disgusting as it sounds; it was a toilet hut. but there were no toilets.. only a space inside where people go.. and behind it, were two small cubbys, well insulated, and apparently, no one used it as a toilet. Why did we choose to sleep inside? 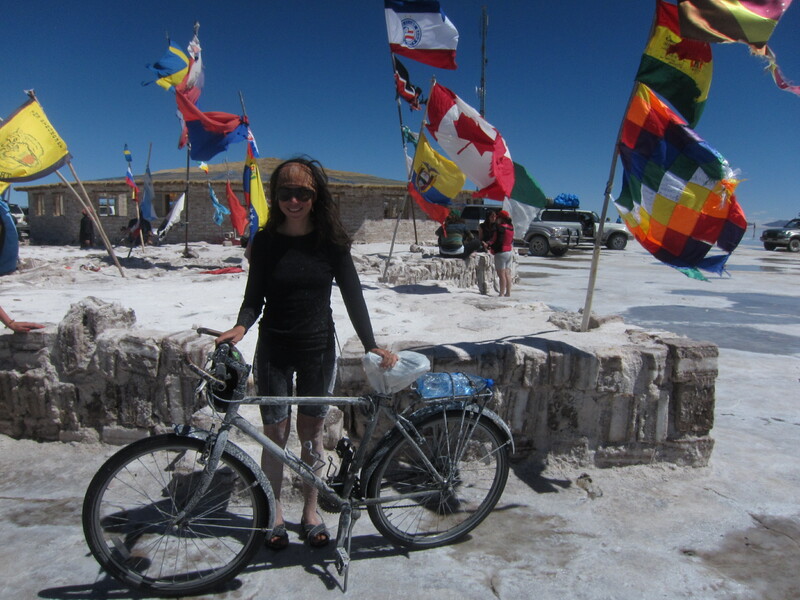 Because at 4,800 meters (the highest elevation i have slept at!) the outside temperate plus wind chill was unbearably cold! it got to – 5 C, maybe a bit lower, that night. 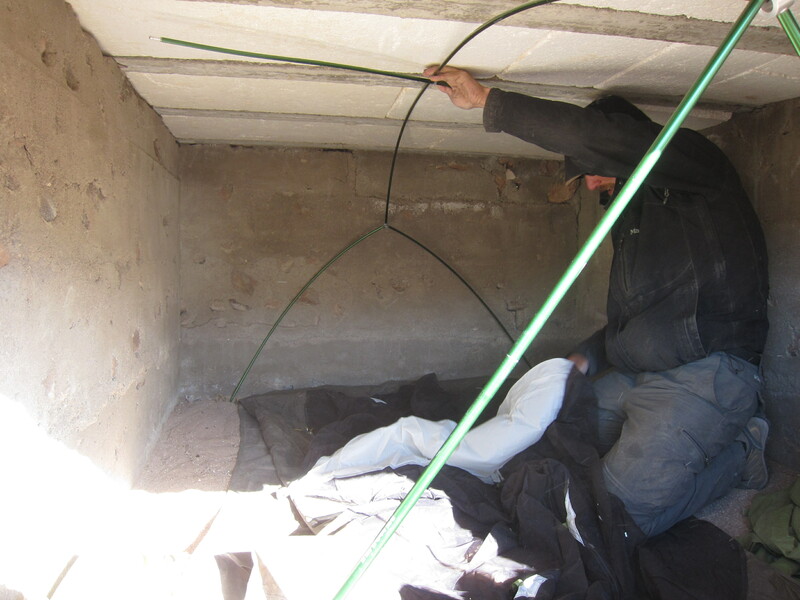 Paul sets up the tent in the cubby. It was a few centimeters too short.. but we improvised.. 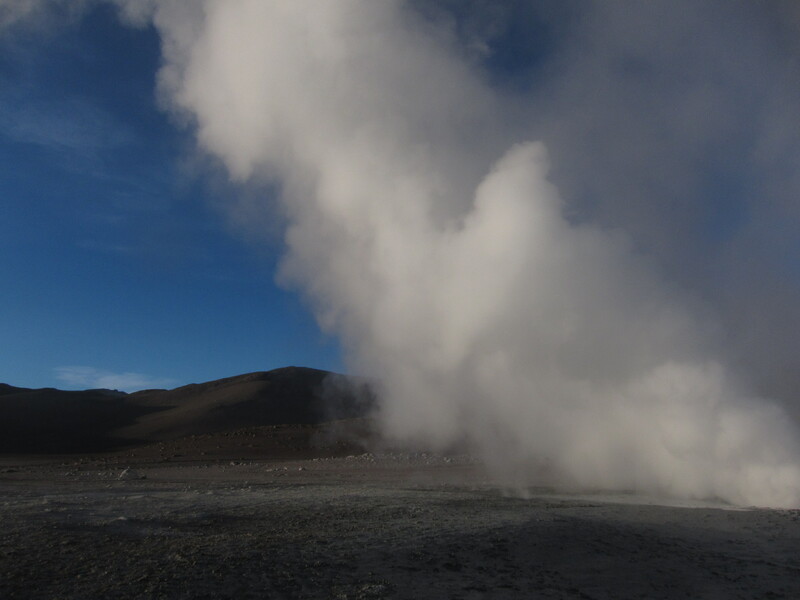 The following morning, the geyser steam raised to the sky at Sol de Mañana. 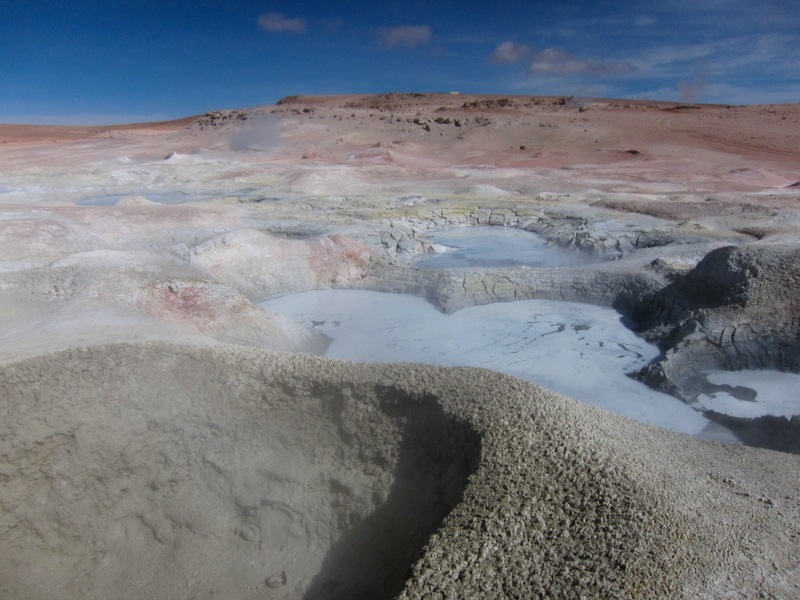 The mud lakes and steaming pools of boiling mud. 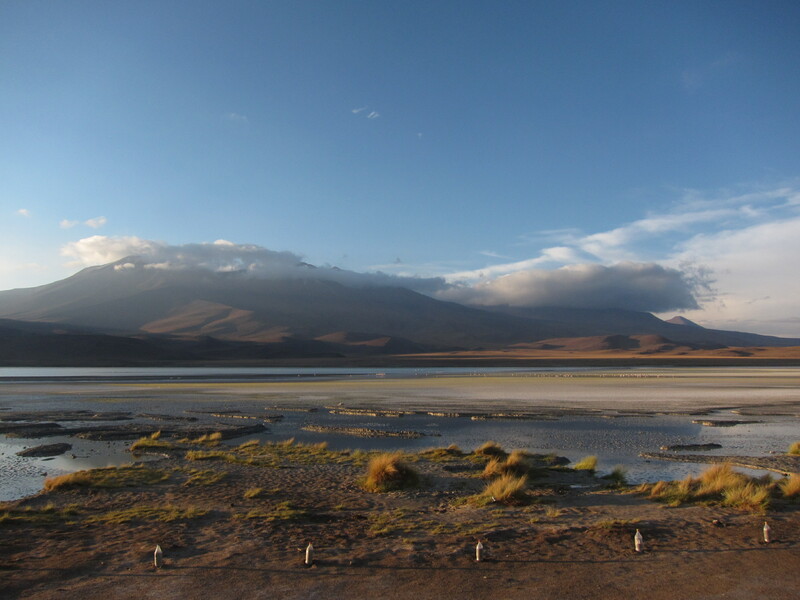 Later in the day, we approached the Laguna Chilviri, where there was a hot spring pool. This lake was so beautiful. the colors of the lake were a mix of crystal blue and greens. Here, I may have seen an Altiplano cat who ran below the road..
After the refreshing and relaxing bath in the pool, we continued on to find a camp spot near the Desierto del Dalí. 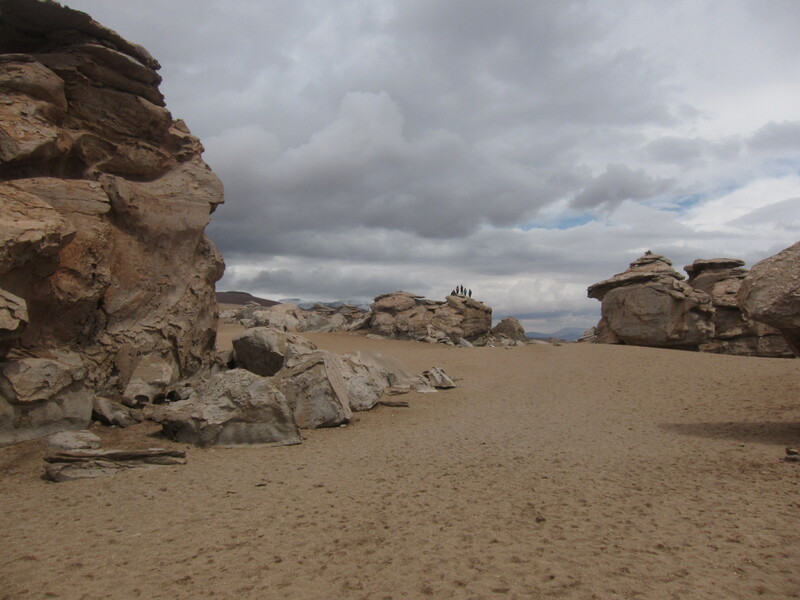 Turned out the Desierto del Dalí, is about 4 kilometers of the road in sand.. We were hoping to use the rocks as windbreaks.. but too far. 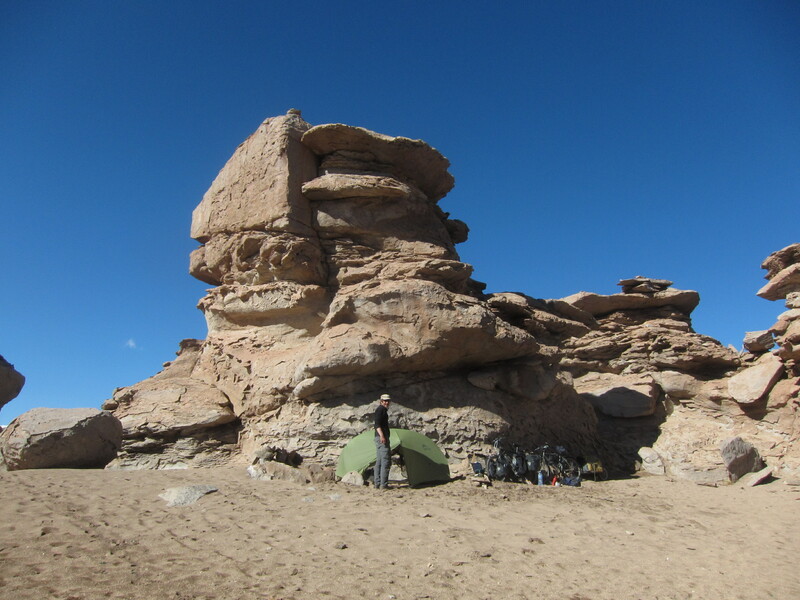 so we camped across the road by the smaller boulders. They didn’t provide windbreak.. but eventually the wind stopped, as it usually does in the evening. Woke up to yet another perfect blue sky. Back on the road, before us, the desert of Dalí-like stones shone in the sun. We felt the near end of this long journey in the desert. 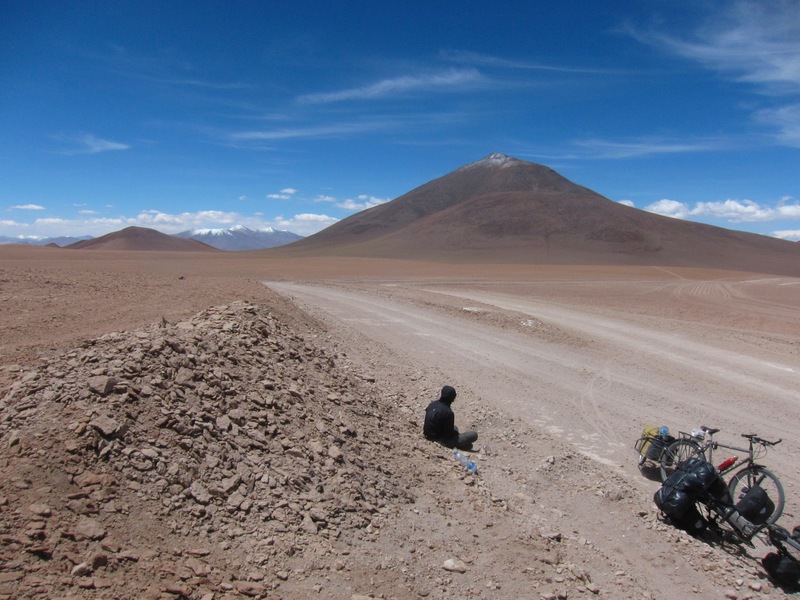 Our last climb of this SW Bolivian route, up to 4,700 meters, was on a gravel-filled road. Crazy truck drivers raced down the road one after another. We jumped out of the way to let the mad train pass. This part of the road was fantastic. 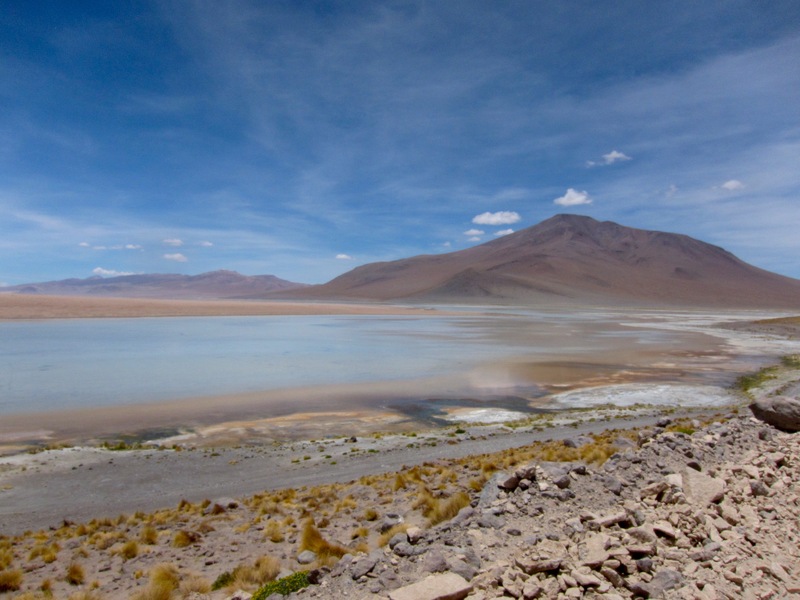 The view of the volcano, Licancabur, indicated that Chile was on the other side of him and there were the last lakes to cross. 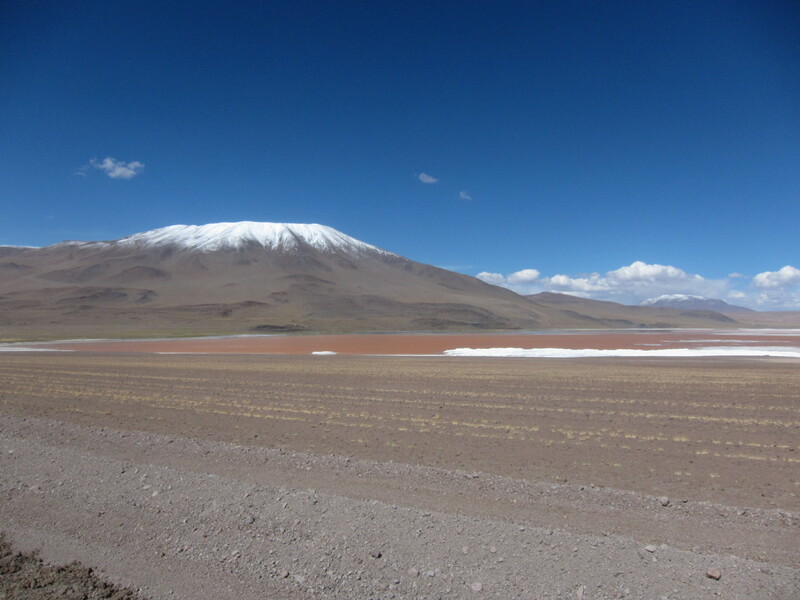 Laguna Blanca.. it does not appear white, per se.. but we assume that in some seasons and certain daylights, it would. 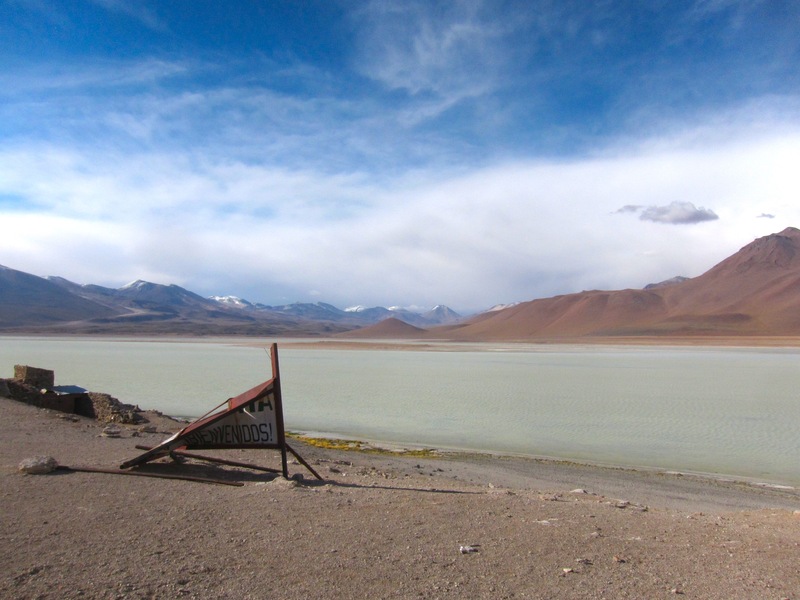 We saw the Laguna Verde, but it wasn’t the season to see it in full green action. Here, we were at an abandoned refuge. Some of those old trains like the ones back in Uyuni, were found laying around here, too. The next morning, I rode on and Paul went back to search for his lost camera. Yea, it was an accident of loosing it the day before. At this point, you can imagine spending nearly two weeks lost at desert with someone, the last thing you want to see, is them. We split here, as I rode on to the border. We knew we would see each other in San Pedro, anyway. That gift.. was a paved road. Hooray!!! 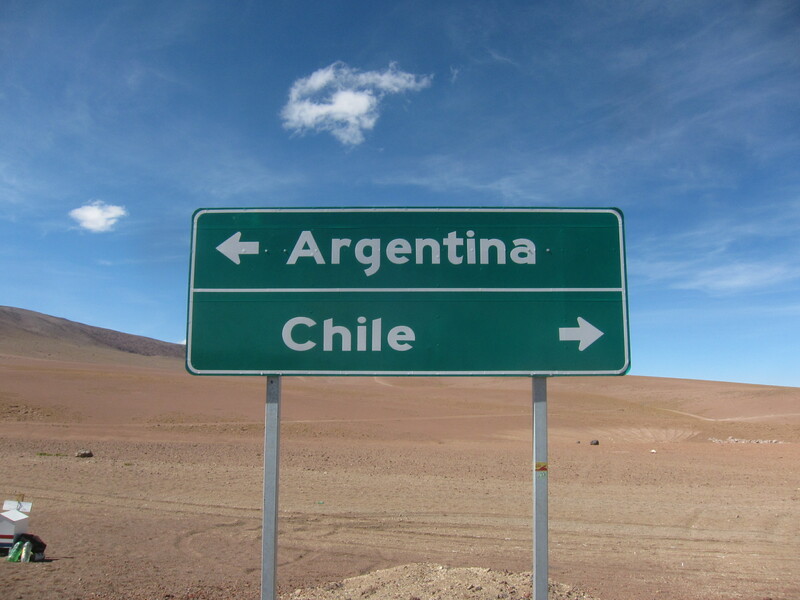 Hmmm… I’ll take Chile for now. Here we are! Country number 14th to cycle! 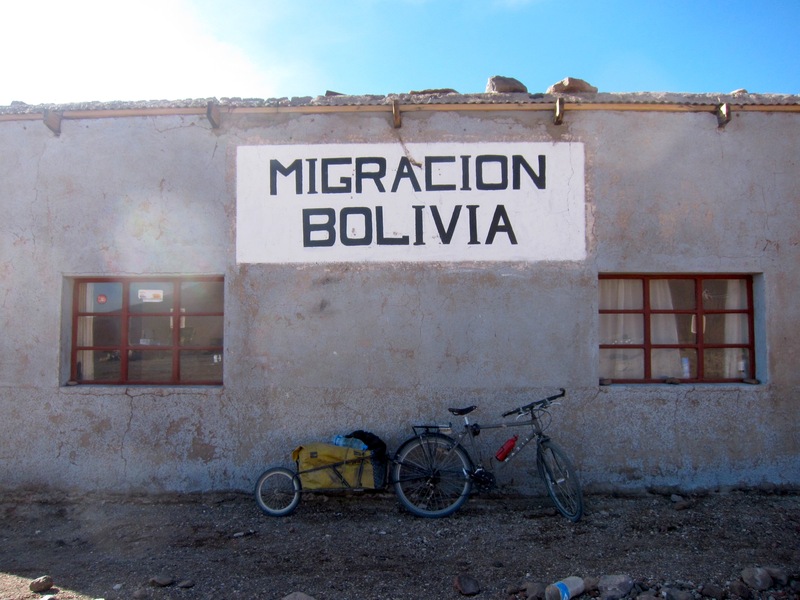 It was a love/hate-relation ship with Bolivia. More love than hate, of course. 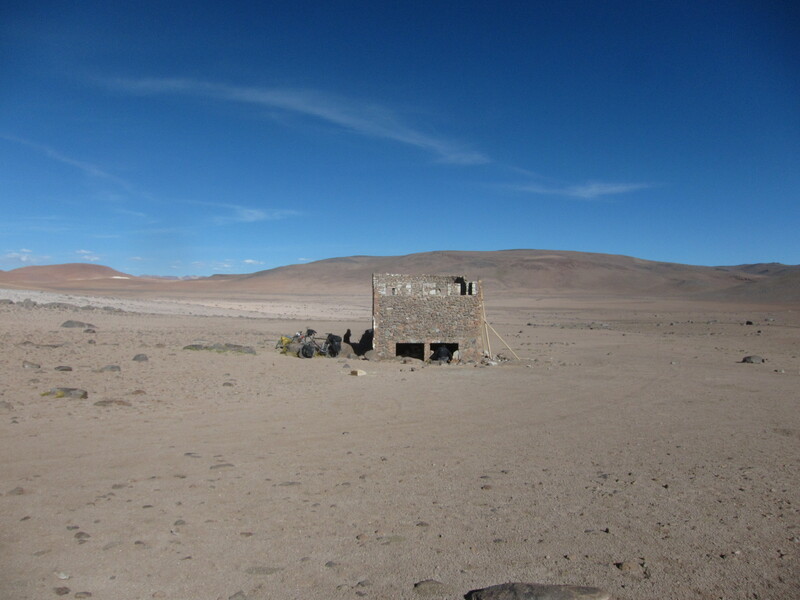 Despite the lack of roads and human accommodations, it benefits the conservation of this unique ecosystem. It was a unforgettable journey, that I already miss. Thanks to my partner, Paul, who wiped off my tears and gave me a hand-up to keep going. Thanks to the few who stopped to offer their help and gave us protection from the cold nights. 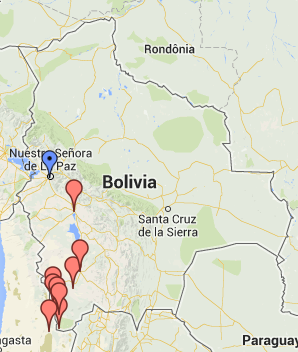 And big thanks to the contributors of the Cycling SW Bolivia PDF, which was very helpful for this challenging tour. Thanks for reading. ‘Til next time! Previous: Previous post: Riding our way into a New Year! 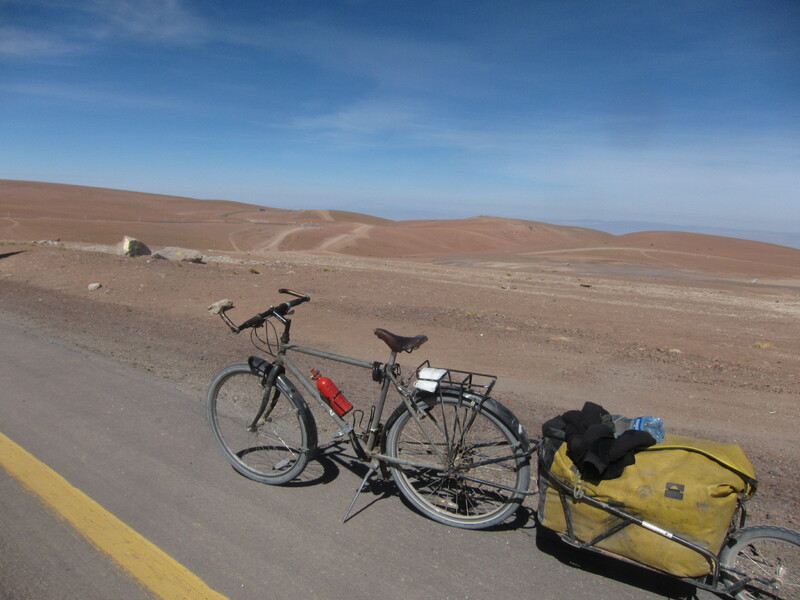 Next: Next post: For my next tour, I will cycle from Chile to the Moon, 2020. Donations and support welcomed! Thank you, Brigitte! It was exceptional. Worth every minute! I do hope you enjoyed your journey in CR. I have a friend who just arrived there today. I am excited for her. Much love. Hope all is well.